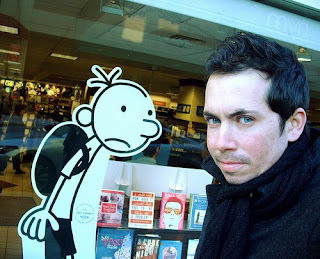 Mishaps and Adventures: DIARY OF A WIMPY KID: THE LAST STRAW is available! 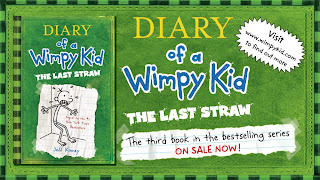 DIARY OF A WIMPY KID: THE LAST STRAW is available! 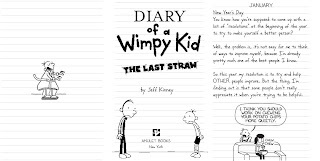 Today marks the release of DIARY OF A WIMPY KID: THE LAST STRAW the third book in a proposed 5-7 book series. It has been in the works for over a year and finally it is here for the world to see. Jeff really begins to hit his stride with this latest installment. 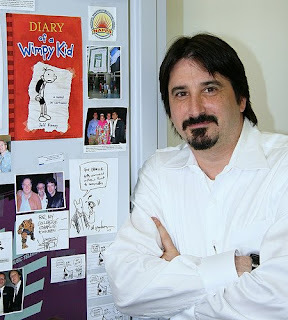 Over the past year we have work together to build and maintain the Wimpy Kid brand from Stickers, Tattoos, Multiple book displays, Advertisements, Standees, Variant covers, Gift cards and much more. So today we celebrate and look forward to the next book and beyond! 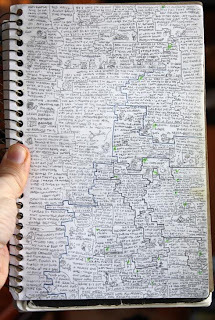 The image show Jeff's own journal and his process of coming up with new ideas. 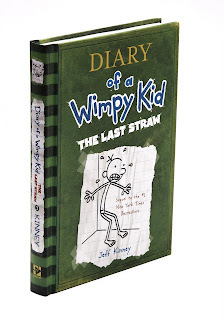 Abrams is releasing Diary of a Wimpy Kid: The Last Straw today and has announced a 1 million-copy first printing. Our reviewer says the third volume in the series will be a sure-fire hit. 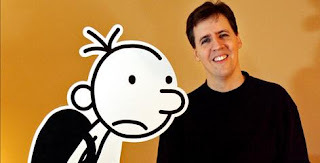 Jeff Kinney. Abrams/Amulet, $12.95 (224p) ISBN 978-0-8109-7068-7 The third book in this genre-busting series is certain to enlarge Kinney’s presence on the bestseller lists, where the previous titles have taken up residence for the past two years. Kinney’s spot-on humor and winning formula of deadpan text set against cartoons are back in full force. This time, Greg starts off on New Year’s Day (he resolves to “help other people improve,” telling his mother, “I think you should work on chewing your potato chips more quietly”) and ends with summer vacation. As he fends off his father’s attempts to make him more of a man (the threat of military school looms), Greg’s hapless adventures include handing out anonymous valentines expressing his true feelings (“Dear James, You smell”), attempting to impress his classmate Holly and single-handedly wrecking his soccer team’s perfect season. Kinney allows himself some insider humor as well, with Greg noting the “racket” children’s book authors have going. “All you have to do is make up a character with a snappy name, and then make sure the character learns a lesson at the end of the book.” Greg, self-centered as ever, may be the exception proving that rule. Ages 8–12. (Jan.) . I came here from my blog (the one about the snobs not mentioning DOAWK#3) and am now wondering--where can I get stickers or tattoos? I am in a pretty small town in NW Montana--we do have a Borders--but have never seen any Diary merchandise. It would be so cool to have some of that stuff for prizes here in my library because this it THE hottest thing going around here. Can you direct me to a place to order some? Thanks so much and I LOVE your work! What a cool job you have!